Paper Pawz: World Card Making Day! I am following the fun on-line celebration today one of my morning projects is inspired by the first My Favorite Things challenge ROYGBIV - Rainbows! My inspiration came from the MFT Celebrate die (which I just picked up this week). I die cut it from Neena with fun foam and had fun with my Distress Inks to create my rainbow. 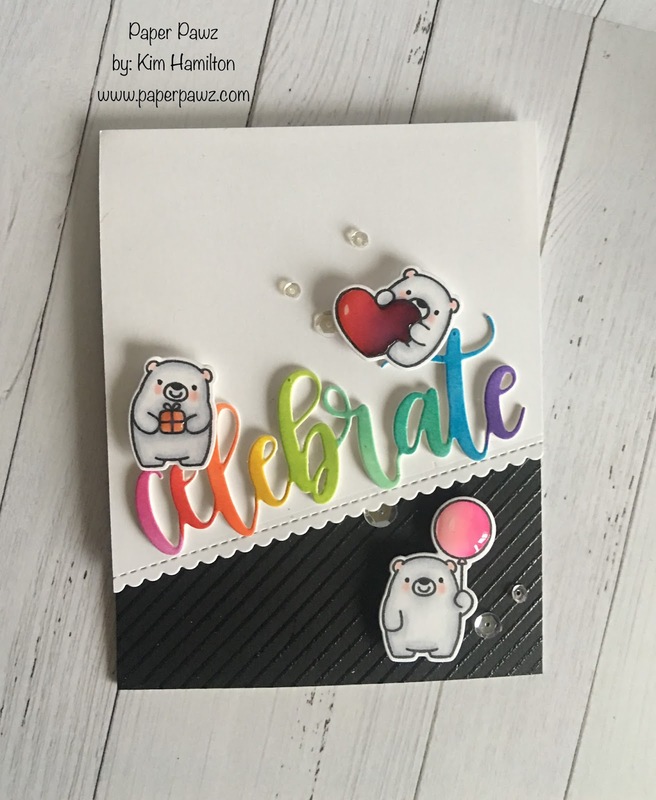 I then felt these adorable Bitty Bears would pair perfectly :) The stitched scallop border die is also from MFT as is the diagonal background stamp I used with clear embossing for the black card stock accent panel. Not only are those bears too cute, they are very quick to color with my Copics. I used the matching dies and put my card together. I finished off my project with Sparkling Clear Sequins! Going back to check on more challenges! MFT will have four total today I believe! Happy card making! How cute is this card? I saw it on the SSS site while I was uploading mine. Your card just caught my eye, Kim, I love these little bears! Beautiful creation! Wow, this is perfect. B&W with a blast of color in the sentiment. Nicely done!